This month we have a bit of everything from a concealer to a beautifully fragranced bath oil to a favorite new sunscreen. Let's check it out below! 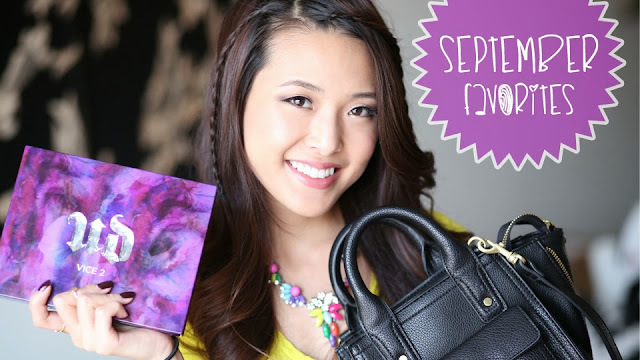 As I mentioned in the title, there is also a bit of a hidden giveaway in this favorites video! I should list that another favorite of mine this month has been a site called Luvocracy which is similar to Pinterest, but the concept is more about easily sharing what you love and recommend with others and actually being able to buy those products. One of the biggest struggles I've found in the blogging world is that you may see an outfit on someone or a makeup look and not be able to hunt it down. Luvocracy has offered a $100 giftcard through the site for one of my followers and the only thing you have to do is sign up for an account through the link http://www.luvocracy.com/frmheadtotoe and leave a comment on my Youtube video saying you entered. The giveaway will run for 1 week, closing October 9th at 11:59pm PST. Honestly this site has been great for organizing the things that I love and want, especially as it comes closer to holiday time. I'm notorious for not having answers when people ask me what I want for Christmas or my birthday (also in December) so now I can keep track of each item that comes up. Same with people asking for recommendations, here you can see everything that I'm loving too! Good luck with entering the contest and I hope you enjoyed this month's favorites! Readers, what is your highest recommended beauty product this month? How do you keep track of your "wants" list? Let me know in the comments below! Hi Jen! I signed up for the luvocracy! Is there a way for me to follow you there? Love the Urban Decay Palette! I love that PL bag! I spot the new purple skin79 bb cream on your luvocracy list. Have you tried it? If you have can you please do a review? Jen, I signed up for the luvocrazy. Love the Urban Decay palette! Love the concept of luvocrazy but is the concept easier than Pinterest & Polyvore? I find it to be more specific since it's product-focused versus random images & ideas. You can gather exact things you recommend and want. Jen, thanks for the great product recommendations! I also signed up for Luvocracy and can't wait to shop your page! Your hair is absolutely gorgeous in this video. Would love if you posted a tutorial! I love your hair so much! In the favorites are so great! The urban decay palette looks amazing! What a great giveaway, thanks Jen! I think this months recommendation would be Benefits' Rockateur blush, I have been using it non-stop and haven't used any other blush at all since I picked it up! I'd also like to recommend Living Proof hair Primer. It keeps your hair cleaner longer, and is a great heat and environmental protectant for your hair! ^___^ Keeps my curls for 2+ days! hey jen! thanks to your video, I spent my night browsing luvocracy :) so fun! i'm not sure if you respond to comments, but I was just curious - how is this site really different from pintrest? Hiya, just wondering what lipstick you've got on. It looks beautiful on you! What lip product are you wearing please? How is the Cle De Peau concealer for covering blemishes/acne scars? It has high coverage but is best for oily to normal skin types since it's a drier formula and can enhance dry patches that blemishes can leave behind. Make Up For Ever Full Cover concealer is my fav for blemishes. Do you have any suggestions for any good eye makeup primers? I've tried different eye primers, but after 4-8 hours, the eyeshadow gets smudgy and fades. I have oily skin, by the way. My favorite is Urban Decay Primer Potion! hei , jen . where do you live? i guess , altough u are asian , but you live abroad. Do you? Just signed up for the site! BTW, I love your necklace you wore on your video! oh, are you interested in affiliate program on Commission Junction? Hi, I'm about to try the Shiseido moisturizer, sounds so nice. DONE! Just signed up and watch your youtube, and leave a comment too.